(iii) about 60 to about 99.2 wt % of at least one non-acid, non-acetoacetoxy vinyl monomer. The acetoacetoxy functional polymer may also contain other monomers, such as one or more non-self polymerizing, surface-active vinyl monomers, or one or more adhesion-promoting monomers. The specification also discloses a latex composition containing the acetoacetoxy-functional polymer described above and a poly(alkylenimine), such as poly(ethylenimine). The latex compositions find utility in water-based coating compositions for metal surfaces. The latexes provide anti-corrosive and solvent-resistant properties to the coating compositions. This application claims the benefit of U.S. Provisional Application Serial No. 60/348,131 filed Jan. 15, 2002. Permeability of water and oxygen through the polymer film is a function of both the glass transition temperature (T g) of the polymer film and the temperature of the environment. If the environment temperature is higher than the Tg of the polymer film, water and oxygen can easily permeate the polymer film through the free-volume of the polymer. However, an emulsion polymer with a high Tg may prevent the polymer particles in the coating composition from coalescing and fusing together to form a continuous film. U.S. Pat. Nos. 4,243,416 and 4,243,417 describe the combined use of a soluble complex of a polyvalent agent, a volatile complexing agent, and a corrosion inhibiting anion, to provide latex paints with corrosion resistance properties for application on iron or steel structures. The complex may be represented by the formula M(Z) xAn, where M is the metal cation, An is the corrosion inhibiting anion, Z is the complexing volatile component, and x is the number of moles of volatile complexing agent per mole of M. Examples include zinc ammonium carbonate and zinc ammonium molybdate. In another embodiment of the invention, the acetoacetoxy-functional polymer component of the enamine further comprises about 0.5 to about 5 wt % of one or more non-self polymerizing, surface-active vinyl monomers. FIG. ( 1) depicts the results of panels coated with paints formulated with latexes of the invention and exposed to 300 hours of exposure to salt fog spray. FIG. ( 2) depicts the results of Cleveland humidity tests with panels coated with paints formulated with latexes of the invention. FIG. ( 3) depicts the results of QUV Weathering tests to demonstrate the effect of weathering on gloss at 60° of panels coated with paints formulated with latexes of the invention. FIG. ( 4) depicts the results of QUV Weathering tests to demonstrate the effect of weathering on gloss at 20° of panels coated with paints formulated with latexes of the invention. In the latex of the invention the acetoacetoxy-functional polymer has a particle size ranging from about 80 to about 300 nm. The T g ranges from about 0° C. to about 80° C., or from about 15° C. to about 60° C.
For an acetoacetoxy-type monomer of Formula (I), R 1 is a hydrogen or halogen; R2 is a hydrogen, halogen, C1-C6 alkylthio group or C1-C6 alkyl group; R3 is a C1-C6 alkyl group; X1 and X3 are independently O, S or a group of the formula —N(R′)—, where R′ is hydrogen or a C1-C6 alkyl group; and X2 is a C2-C12 alkylene group or a C3-C12 cycloalkylene group. The alkyl and alkylene groups described here and throughout the specification may be straight or branched groups. Preferred monomers of Formula (I) include acetoacetoxyethyl methacrylate, acetoacetoxyethyl acrylate, acetoacetoxy (methyl)ethyl acrylate, acetoacetoxypropyl acrylate, allyl acetoacetate, acetoacetamidoethyl (meth)acrylate, and acetoacetoxybutyl acrylate. Acetoacetoxyethyl methacrylate (AAEM) represents a particularly preferred monomer. The term “(meth)acrylate” is used here, and throughout the specification, to denote both methacrylate and acrylate monomers. wherein R 1 is hydrogen or a C1-C3 alkyl group, and R2 is a C1-C20 alkyl, phenyl, benzyl, hydroxy-(C1-C4)-alkyl, (C1-C4)-alkoxy-(C1-C4)-alkyl, cyclopentyl, cyclohexyl, furyl, (C1-C4)-alkyl-furyl, tetrahydrofuryl, or (C1-C4)-alkyl-tetrahydrofuryl group, or a combination of two or more of these monomers. Variations of R1 can be used to modify the glass transition temperature (Tg) of the film of the copolymer. Specific examples of suitable non-acid, non-acetoacetoxy vinyl monomers include, but are not limited to, methyl (meth)acrylate, ethyl (meth)acrylate, butyl (meth)acrylate, hexyl (methacrylate), isooctyl (methacrylate), isodecyl (meth)acrylate, lauryl (meth)acrylate, stearyl (meth)acrylate, phenoxyethyl (meth)acrylate, methoxyethyl (meth)acrylate, benzyl (meth)acrylate, furyl (meth)acrylate, methylfuryl (meth)acrylate, butylfuryl (meth)acrylate, tetrahydrofuryl (meth)acrylate, ethoxyethyl (meth)acrylate, 2-ethylhexyl (meth)acrylate, cyclopentyl (meth)acrylate, isobornyl (meth)acrylate, hydroxyethyl (meth)acrylate, hydroxypropyl (meth)acrylate, and combinations or mixtures thereof. Other non-acid, non-acetoacetoxy vinyl monomers that may be used include styrene derivatives and vinyl derivatives. Examples of suitable styrene derivatives include, but are not limited to, styrene, vinyl toluene, o-methyl styrene, p-methyl styrene and m-methyl styrene. Vinyl derivatives include, but are not limited to, vinyl esters such as vinyl acetate, vinyl propionate, vinyl 2-ethylhexanoate, vinyl neononoate, vinyl neodecanoate, and vinyl esters of versatic acid. Such monomers are described in  The Brandon Worldwide Monomer Reference Guide and Sourcebook, Second Edition, 1992, Brandon Associates, Merrimack, N.H.; and in Polymers and Monomers, the 1996-1997 Catalog from Polyscience, Inc., Warrington, Pa.
For example, a coating composition of the invention may comprise a water-based latex of the invention, a pigment, and one or more additives or fillers used in latex paints. Such additives or fillers include, but are not limited to, leveling, rheology and flow control agents such as silicones, fluorocarbons, urethanes or cellulosics; extenders; coalescing aids; reactive coalescing aids such as those described in U.S. Pat. No. 5,349,026; flatting agents; pigment wetting and dispersing agents and surfactants; ultraviolet (UV) absorbers; UV light stabilizers; tinting pigments; extenders; defoaming and antifoaming agents; anti-settling, anti-sag and bodying agents; anti-skinning agents; anti-flooding and anti-floating agents; fungicides and mildewcides; thickening agents; plasticizers; reactive plasticizers; and curing agents. Specific examples of such additives can be found in  Raw Materials Index, published by the National Paint & Coatings Association, 1500 Rhode Island Avenue, NW, Washington, D.C. 20005. An emulsion polymerization was conducted in a two-liter reaction kettle equipped with a condenser, a stirring shaft with motor, and a nitrogen purge. Approximately 557 g of DI water, 7.20 g of MAPHOS 60A, and 2.57 g of ammonium hydroxide (28% NH 3 content) were added to the kettle. The contents of the reactor were then heated to 80° C. In a separate flask, a mixture of 379 g of styrene, 255 g of butylacrylate, 72 g of 2-acetoacetoxyethyl methacrylate, and 28.8 g of 2-acrylamido-2-methylpropane-1-sulfonic acid (AMPS) surfactant were stirred into 340 g of water containing 2.57 g of ammonium hydroxide (28% NH3 content) and 4.32 g MAPHOS 60A. Approximately 30.3 g of the monomer mixture was then added to the reactor followed by 1.44 g of ammonium persulfate dissolved in 9.0 g of water. After a 15 minute hold period, the remaining monomer emulsion was then fed into the reactor over a 180 minute period. During the same period, 1.44 g of ammonium persulfate dissolved in 21.5 g of water was also fed into the reactor. After all of the monomer feed was added to the reactor, the contents were cooled to 65° C. and 0.82 g of t-butylhydroperoxide in 11 g of water and 0.58 g of sodium metabisulfite in 11 g of water were fed into the reactor over 20 minutes. This addition was followed by 72.0 g of ABEX 2545 surfactant. The results of panels coated with paints formulated with the latexes described in Examples 1, 2, 3, 5, 6 and 7 and exposed to 300 hours of exposure to salt fog spray are depicted in FIG. ( 1). Examples 1, 2 and 6 demonstrated excellent corrosion resistance, with the Example 2 panel (coated with a surfactant-stabilized acetoacetoxy functional latex formulation) and the Example 6 panel (coated with an acetoacetoxy functional latex formulation lacking any polymerizing surfactant) showing particular resistance to the harsh test conditions employed. 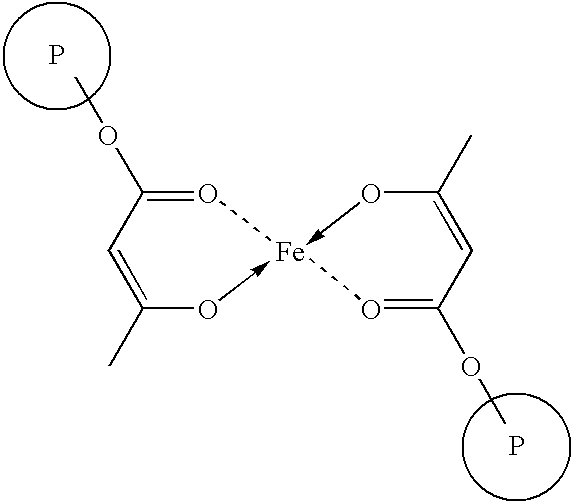 Example 3 (using DETA rather than a PEI) showed substantial corrosion and Example 5 (no carboxylic acid-functional vinyl monomer) revealed little or no anti-corrosive properties. Results of the Cleveland humidity test, depicted in FIG. ( 2), indicated that the panels coated with formulations of Examples 1, 2, 6 and 7 were resistant to rust and blister and retained a good gloss. Panels coated with formulations of Example 5, and especially Example 3, showed fading and substantial blistering under similar conditions. The results of the QUV tests for Examples 1, 2, 3 and 5 depicted in FIGS. ( 3) and (4) demonstrate the effect of weathering on gloss at 60° and 20° readings, respectively. The panels coated with formulations of Examples 1 and 2 exhibited good gloss retention in contrast to Examples 3 and 5 where the films quickly lost integrity, and gloss, and became chalky in the QUV-weathering cabinet. (iii) about 60 to about 99.2 wt % of at least one non-acid, non-acetoacetoxy vinyl monomer. wherein R1 is a hydrogen or halogen; R2 is a hydrogen, halogen, C1-C6 alkylthio group or C1-C6 alkyl group; R3 is a C1-C6 alkyl group; X1 and X3 are independently O, S or a group of the formula —N(R′)—, in which R′ is hydrogen or a C1-C6 alkyl group; and X2 is a C1-C12 alkylene group or C3-C12 cycloalkylene group. 3. The latex composition of claim 1, wherein the monomers polymerized to produce the acetoacetoxy-functional polymer further comprise (iv) about 0.5 to about 5 wt % of at least one non-self polymerizing, surface-active vinyl monomer. 4. The latex composition of claim 1, wherein the monomers polymerized to produce the acetoacetoxy-functional polymer further comprise about 0.1 to about 10 wt % of at least one adhesion-promoting monomer selected from the group consisting of an amine-containing vinyl monomer, an amide-containing vinyl monomer, and mixtures thereof. 5. The latex composition of claim 1, wherein the at least one carboxylic acid-functional vinyl monomer includes methacrylic acid. 6. 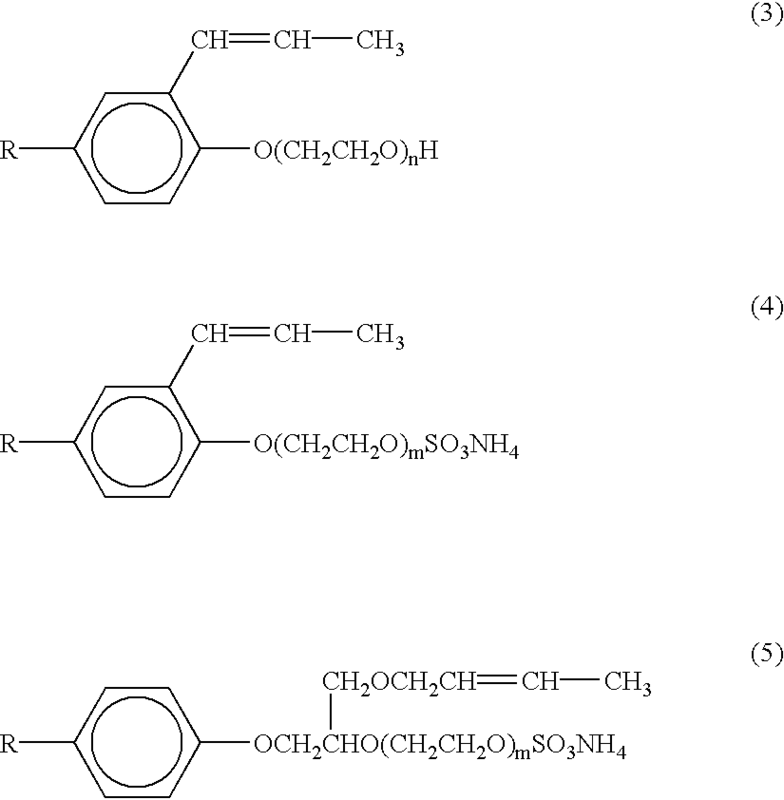 The latex composition of claim 2, wherein the at least one monomer of Formula (I) includess at least one member selected from the group consisting of acetoacetoxyethyl methacrylate, acetoacetoxyethyl acrylate, acetoacetoxy(methyl)ethyl acrylate, acetoacetoxypropyl acrylate, allyl acetoacetate, acetoacetamidoethyl (meth)acrylate, and acetoacetoxybutyl acrylate. 7. The latex composition of claim 3, wherein the monomers polymerized to produce the acetoacetoxy-functional polymer further comprise about 0.1 to about 10 wt % of at least one adhesion-promoting monomer selected from the group consisting of an amine-containing vinyl monomer, an amide-containing vinyl monomer, and mixtures thereof. wherein R is nonyl or octyl, n ranges from 15 to 50, and m ranges from 15 to 40. 9. The latex composition of claim 3, wherein the latex composition is comprised of particles having a size that ranges from about 80 nm to about 300 nm. 10. The latex composition of claim 1, wherein the pH of the composition ranges from about 7.0 to about 10.5. 11. The latex composition of claim 3, wherein the pH of the composition ranges from about 7.0 to about 10.5. 12. The latex composition of claim 1, further comprising a low molecular weight organic base. 13. The latex composition of claim 3, further comprising a low molecular weight organic base. 14. The latex composition of claim 12, wherein the low molecular weight organic base is selected from ammonia, 2-amino-2-methyl-1-propanol, and mixtures thereof. 15. The latex composition of claim 13, wherein the low molecular weight organic base is selected from ammonia, 2-amino-2-methyl-1-propanol, and mixtures thereof. 18. The latex composition of claim 16, wherein the monomers polymerized to produce the acetoacetoxy-functional polymer further comprise (iv) about 0.5 to about 5 wt % of at least one non-self polymerizing, surface-active vinyl monomer. 19. The latex composition of claim 16, wherein the monomers polymerized to produce the acetoacetoxy-functional polymer further comprise about 0.1 to about 10 wt % of at least one adhesion-promoting monomer selected from the group consisting of an amine-containing vinyl monomer, an amide-containing vinyl monomer, and mixtures thereof. 20. The latex composition of claim 16, wherein the at least one poly(alkylenimine) includes poly(ethylenimine). 21. The latex composition of claim 17, wherein the at least one monomer of Formula (I) includes a member selected from the group consisting of acetoacetoxyethyl methacrylate, acetoacetoxyethyl acrylate, acetoacetoxy(methyl)ethyl acrylate, acetoacetoxypropyl acrylate, allyl acetoacetate, acetoacetamidoethyl (meth)acrylate, and acetoacetoxybutyl acrylate. 23. The latex composition of claim 21, wherein the latex composition comprises particles having a size that ranges from about 80 nm to about 300 nm. 24. The latex composition of claim 21, wherein the monomers polymerized to produce the acetoacetoxy-functional polymer further comprise about 0.1 to about 10 wt % of at least one adhesion-promoting monomer selected from the group consisting of an amine-containing vinyl monomer, an amide-containing vinyl monomer, and mixtures thereof. 25. A water-based coating composition, comprising the latex composition of claim 1, and at least one member selected from the group consisting of a pigment, a leveling agent, a rheology agent, a flow control agent, an extender, a coalescing aid, a reactive coalescing aid, a flatting agent; a pigment wetting agent, a dispersing agent, a surfactant; an ultra-violet (UV) absorber; a UV light stabilizers, a tinting pigment, extenders; a defoaming agent, a antifoaming agent; an anti-settling agent, an anti-sag and bodying agent; an anti-skinning agent; an anti-flooding agent; an anti-floating agent; a fungicide; a mildewcide; a thickening agent; a plasticizer; a reactive plasticizer and a curing agent. 26. A method of protecting a metal surface from corrosion, comprising contacting the metal surface with the coating composition of claim 25. ES450388A1 (en) * 1975-08-08 1977-12-01 Hoechst Ag Procedure for plastic dispersions.